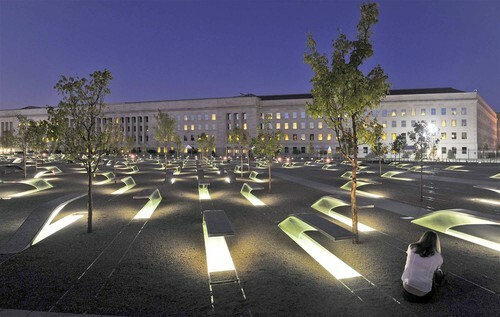 This is very close to where I stood with 400 grieving family members a few days after 9-11. 9-11 means a lot of different things to people. Everyone has a story of where they were on that day. I just happen to be one of those people who spent 45 days smack dab in the middle of the pain, agony, and destruction of 9-11. On 9-11 I was stationed at a large intel base. 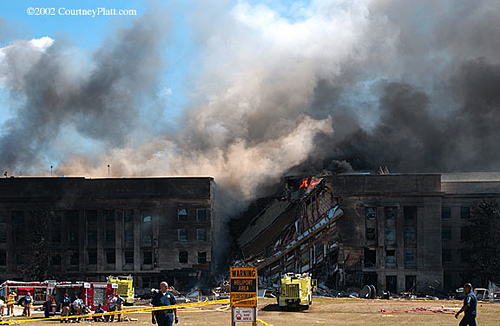 We were considered a top 10 target and a mass evacuation of non-military personnel started right after the Pentagon was hit. I don’t remember much because it was so chaotic and terrifying. What I do remember is my friend was 8.5 months pregnant with her first child, and her then husband worked at the Pentagon. The phones were jammed, so we waited until early evening before we knew that he was safe, having hiked up I-395 to get a ride back to our base. I stayed with her all day to make sure that she was ok. We huddled inside the Marine barracks, terrified of every jet engine we heard over head. Our base was in the BWI flight path. I remember a blazing sun against a crystal blue sky. I remember people running frantically. I remember armed Marines running with M-16s to secure our base. I remember bracing for impact and being sure that death was coming. I had never been that terrified in my entire life. I don’t think anything else has matched it since (other than when the PTSD was rally bad 10 years ago). Thank God! Once the initial attacks cleared, my reaction was that I needed to help. I lived a few miles from DC. I needed to do what I could to help those in need. Rather unexpectedly, a friend of mine, with a similar drive, said that she was being sent by our base to serve the families of those killed at the Pentagon. I said that I was going with her, and so 8 of us from my base went to the Pentagon Family Assistance Center to serve the surviving families. The Navy lost more people than any other branch or Agency, and they wanted us there in uniform in case the families wanted a Sailor to talk to and also to serve them in any capacity necessary. The first few days were agony. I witnessed the deepest in human suffering. My 20 year old heart and mind, was not prepared for this level of pain. My faith was still young and weak, and it was not my primary rock throughout that period. I had to fight my own tears, in the face of hurting, mourning people. A few days after the attack, I stood in front of the crash site with over 400 mourning relatives. I knew that I was staring into the abyss of Hell. Only Hell could bring such destruction and barbarity. While 9-11 will haunt me for the rest of my life, I did witness the strength of the human spirit. The first couple of weeks were devastating. The wounds were deep and fresh. Families waited helplessly for news of their loved ones. No one survived the attack, and all 184 perished. When bodies started to be returned to families (what was left of their loved one), families had a sense of relief. Over 40 bodies were never recovered. Once this phase began, I noticed a shift to healing. The pain was deep, but there was the very beginning of hope and healing. By the end of my 45 days as a relief worker, the families had returned home to begin to re-build their lives. 9-11 is a defining moment in my life, because, unlike the majority of the world, I was actually a part of the event. I was there in all its horror. This day has meant many things for me: pain, agony, suffering, tears, mourning, nightmares, night terrors, flashbacks, hope, love, courage. Today it means: prayer. These people who perpetuate this type of evil are still murdering thousands of people throughout the world. The leaders of the West are impotent in the face of this evil, quite frankly, because in their nihilism they do not know good from evil, or evil from good. So I wage the spiritual battle and I pray, fast, and give alms. That is how I best serve the memories of those I met and their loved ones. It is how I best served those being persecuted abroad. It is how I best serve the persecutors. So PRAY and pray hard, for the conversion of souls, for those murdered today (and every other day), the families, and the relief workers. And, yes, because my 9-11 experiences make me feel a deep connection to the persecuted, check out Help Nasara to give alms. We are trying to serve the suffering. God bless you always.